The purpose of this chapter is to show how making content more visible, placing it in a gaming format, and using analytics techniques for continuous improvement, will enhance online teaching and learning. This is achieved by using online tools and techniques such as interactive and visual video presentations and discussions, colorful graphics, charts, images and interactive games while using analytics software to gage their effectiveness. The goal is to maximize online course effectiveness—and at the same time, learning. The formula is straightforward. Visualize the content (make it more spatial), game the content (make it more interactive), and analyze (examine carefully and in detail) both the instruction and the learning for continuous enhancement. 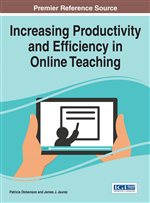 Educators often offer one of these instructional maximizers as the savior of online course effectiveness but seldom consider the positive synergistic effect in integrating and using all three at the same time, as this chapter will do. The author’s first experience with online academic courses and related educational technology began over 10 years ago when National University (NU), whose main campus is in La Jolla California, began placing some of its courses online, based on some guidance and assistance from Stanford University which was reputed to be the first university in California start an online academic program. The Blackboard Learning Management System (LMS) was the NU online platform on which the first classes were designed, developed and placed on line. The first courses at NU were primarily text oriented and were, in essence, just the text oriented content of the on-site classes moved on-line. There was almost no content in multimedia and those classes that contained PowerPoint presentations were considered high tech. Coming from an Information Technology (IT) background, the author was familiar with various presentation software and was considered one of the faculty with high tech courses since he had several PowerPoints in all of his classes. He became a most sought after “technology” expert by other faculty members who wanted to add PowerPoints to their classes. In time, NU changed from the Blackboard LMS to the eCollege LMS and added an embedded video teleconferencing system into the classes for faculty to use for academic purposes. Setting up and conducting live video teleconference sessions with students was challenging for most faculty members, especially those who considered themselves “digital immigrants” with low technology skills.